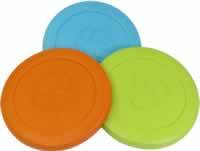 In the world of flying disc or frisbee dog toys, the Zisc Mini flies to the top. Designed to fly far and straight from a durable material that isn't hard on dogs' mouths...keeping active dogs happy and playing for hours! Its pliable material allows your dog to pick it up from flat surfaces with ease and will not hurt or damage their soft mouth. In your garden, at the park or on the water (it floats!). Can be washed in the dishwasher. Made from West Paw Design’s extremely pliable, one-of-a-kind proprietary material called Zogoflex – this is a most versatile and strong toy.